Since the block is called Four Flowers I decided to choose a variety of colours for the "flowers" and the remaining fabric (other than the background) to be the stems and leaves. This made for an easy selection of green for those pieces. The block could be used as a study in flying geese as those are the only patches used, other than squares. This block is an easy block to construct and gives you lots of practice sewing those flying geese -- a frequent patch in quilt blocks and a favourite of mine. This quilt block is sewn as a two step process. I contains an uneven nine patch block as its centre and then the additional patches are added on the outer edges of that block, in the same manner of an uneven nine patch. 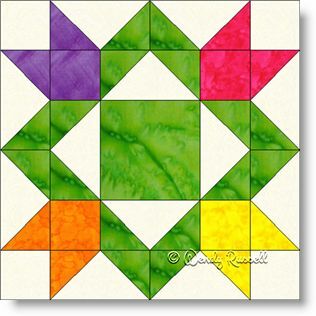 The two sample quilts illustrated are created using two standard layouts -- a side by side placement of the blocks and a setting on point with additional colour in the blank blocks, which is a place to showcase your quilting design.